One of my key garments is a shirt-jacket. 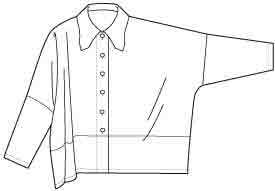 I had fun recently looking at older shirt-jacket wardrobe patterns on Etsy. There were dozens of very similar patterns published in the 70s to 90s. Here’s one from the 70s. McCall’s 3280, 1972. This look was popular for decades. A recent pattern like this was only discontinued a short time ago, Butterick 4811. 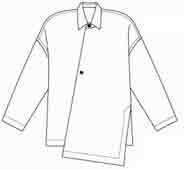 In the late 80s to 90s, there was also another popular look for unlined casual jackets – oversized and collarless. Here’s McCall’s 7501, 1995. Huge oversize supported by huge shoulder pads, worn with a small skirt or full pants. So, what is it about these styles that makes them look not quite up to date ? Well, some designers have been showing oversized jackets in recent seasons, but usually without the huge support structures, and worn with slim pants or leggings. You Look Fab has a post about these here. Jackets like this haven’t reached this suburb (except for the students who buy men’s overcoats from the charity shops). These days there’s so much freedom in fashion, you can find at least one designer who uses any given look. I’ve tried to focus on what’s frequently seen. Here’s what I might replace those looks with. New wardrobe pattern for wovens, Butterick 5821. 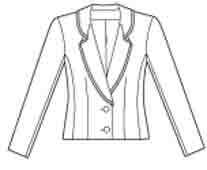 For a less casual jacket look, use the wardrobe jacket, but thigh length and without the hem casing. Add a waist casing for this season’s waist emphasis if that suits your body shape. Lots of seams for adding hip width if you’re pear shaped. Or Nancy Zieman’s knits wardrobe McCall’s 6247. 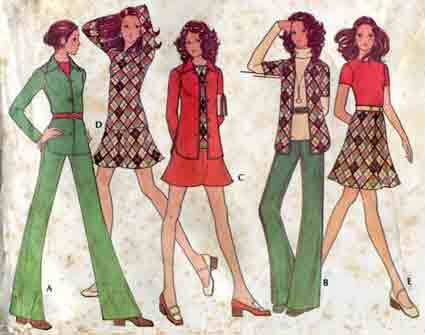 I want a shirt-jacket wardrobe so would add McCall’s 6606, especially lower right. What are the differences compared with earlier styles ? Ignore the curved versus straight style elements, a matter of personal style. I think the key is proportions and silhouette. 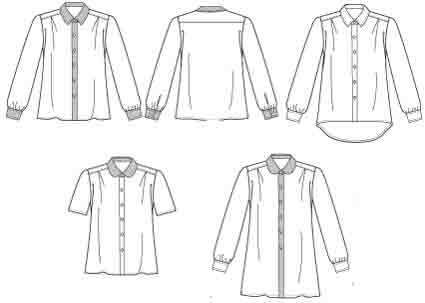 Shirts are now often not mid hip length but low hip or thigh length. The trendy shirt look is slim with slight waist shaping, such as Butterick 5678. A narrow belt at waist is ‘this season’. Or oversized but without the huge shoulder pads, such as Katherine Tilton Vogue 8748. Or for overlayers, try the indoor poncho look in a woven fabric, see McCall’s 6603. Both slim shirts and big trendy tops are worn with slim pants/ skirt or leggings. 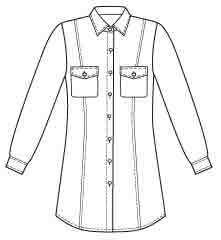 The current casual shirt look is looser fitting, as in McCall’s 6606 shown with the wardrobes above. Straight not shaped to the body, but not very loose fit. 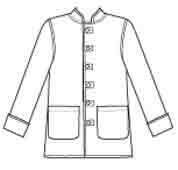 Even the new Palmer-Pletsch unisex shirt (McCall’s 6613) has 4 inches of ease not 8. Worn with straight or boot-cut pants. The ways style elements are used to emphasise the shoulders has also changed. – wide spreading or high collars. – fitted or slightly dropped sleeves. Shoulders dropped well down the arm are coming back as they’re essential for over-sized styles, but they’re not generally used. Though dropped shoulders are featured by some boutique designers – like the Katherine Tilton shirt – as arty rather than trendy personal style. 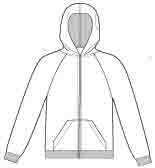 Raglan sleeves rather than dropped shoulders are currently used on gear for easy movement like sweatshirts. or subtle rather than full A-line. Knee length or shorter, or below knee, or calf length. Or short and flirty pleated (one of the very, very few styles I think is best worn only by the young). You can wear a full skirt if you like the ease of movement. Make it in soft fabric so the silhouette isn’t wide and stiff (unless you’re going for a vintage look), and wear at lower calf length with a fitted top. or boot cut rather than flared. All styles in new Butterick 5818. You can wear very full or very flared pants (with a high-hip length top) if you have the body shape for them, but happily we haven’t got to wear them if we haven’t ! P.S. Lovely new post by Imogen Lamport on what is in/out of style – letting go of trends. Nowadays there aren’t many full wardrobe patterns in shirt-jacket style. There are many patterns for shirt plus pants. Add a simple top, and a skirt if you wear them. The Vivienne Files post on building a wardrobe by fours started me on yet more thoughts about basic wardrobe building. Perhaps it’s part of your personal style that you don’t like to plan, prefer a free-flow approach to choosing your clothes, and just use general guidelines on colour and shape so you haven’t got a closet full of orphans. If instead you want the simplest possible scheme for wardrobe building – add small groups, rather than a whole wardrobe all at once. What are the garment types you wear all the time : dresses or jeans ? shirts or tees ? jackets or sweaters ? If you’re not sure, look at my personal wardrobe plan post. What clothes grouping do these items make ? Would it suit you to build your wardrobe in co-ordinated capsules of 4/ 5/ 6 items, or individual outfits of 1/ 2/ 3 items ? Here are the common possibilities. Small groups which include enough clothes for you to make several outfits. Often 2 tops, 2 bottoms. For example, Butterick 5333. Easy to make four different outfits. If one top can layer over the other, that adds two more outfits. Janice of The Vivienne Files builds a basic wardrobe of 12 items by adding 4 items at a time. Here’s her original post. – Core Four – sleeveless and sleeved tops, skirt, pants, in interesting colour. – Expansion Four – 2 more tops and bottoms, in neutral colour. – Mileage Four – more tops, in fabrics which combine colours. She calls her approach ‘Four by Four’, and adds 4 accessories to the 12 clothes. I’ve written posts on patterns for her original scheme, and on adding layers. Janice has several other posts suggesting four-by-four wardrobes, with good illustrations of outfit combinations. 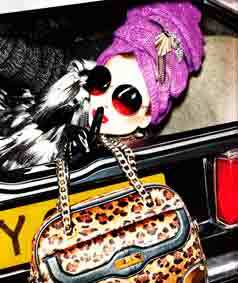 See her Archive for May 2012, and here. (In that post the Core 4 is 3 tops, 1 bottom – sweater knit, shirt, tee, pants). P.S. 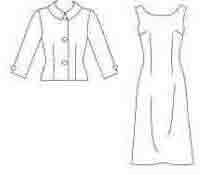 Janice now has a post on building up to a Project 333 wardrobe in groups of 4 items, each group in one colour. To me her later mixed version is more interesting but also more difficult to achieve. Janice’s 4×4 clothes are rather similar to Nancy Nix-Rice’s 12 item basic wardrobe. Nancy makes nearly 100 different outfits from her 12 clothes. 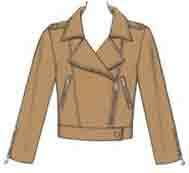 – Start with one of each item needed (Nancy’s Core 4 is jacket, top, skirt, pants), in a dark neutral. – repeat in a light neutral, using the same or more relaxed styles. – add another 4 with fabric interest to add variety : a top and layer in an accent colour, and a 2-piece dress in a mixed colour print. She also has a post on a 16-item travel wardrobe. I wrote a post on patterns for Nancy’s starter 12 here. See full list of my posts about her wardrobe on Index page 4. 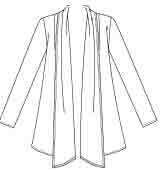 Or there’s Eileen Fisher‘s ‘system’ of wardrobe basics. Her ‘system’ changes from season to season. (For the current version, see the Eileen Fisher Video on “What if it were this easy”.) She makes co-ordination especially easy by having nearly everything in black ! perhaps with one cream top and one grey one. In summer 2010 the ‘system’ consisted of 3 Core 4s : 3 layers, 3 tops, 3 skirts, 3 pants. Here’s my post on patterns for that. 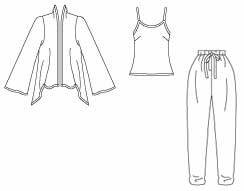 Judith Rasband recommends a basic wardrobe ‘cluster’ of 5 items. 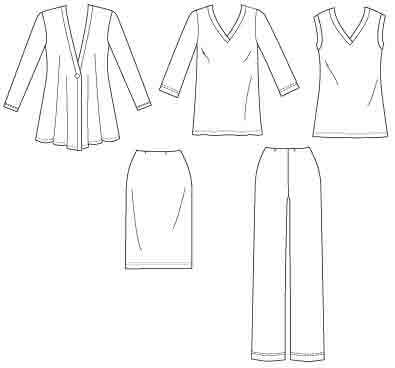 Such as : jacket/ layer, 2 tops, skirt, pants. See her Wardrobe strategies for Women book, and 5 Easy Pieces DVD. 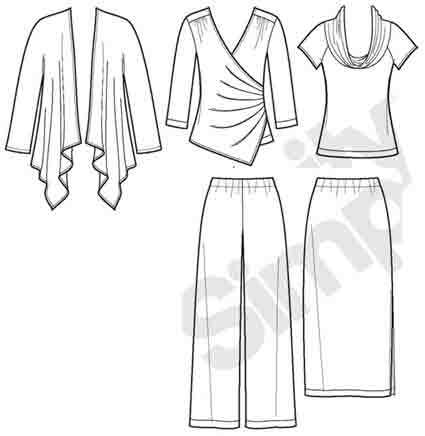 These particular 5 items make 10 different outfits (including layering the wrap top over the cowl one.) Add some scarves or statement jewellery, dressy and casual shoes – and there’s your wardrobe for a week’s trip ! To build on this basic group, Judith Rasband adds one item at a time. So long as each new item co-ordinates with all the items you already have, it can double the number of different outfits possible (see my power of the boring post). My personal Vital 5 is rather different, as in winter I need 5 garments to make one outfit. I don’t own any fitted jackets or dresses, and only wear skirts on formal occasions. But I can’t get my wardrobe needs down to less than 5 different types of item : shirt, pullover layer, shirt-jacket layer, vest, pants. 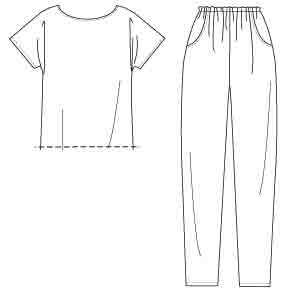 Simplifying, that’s shirt, pants, and 3 added layer options. In winter I wear all 3 added layers at the same time ! I could repeat this group two or three times, to make a wardrobe of 10 – 15 items. ejvc’s 6 item 6PACs are another capsule-to-wardrobe building idea. Make a 6 item capsule each season, following the colour suggestions (3 neutrals, accent), and you have a marvellous 24 item co-ordinated wardrobe by the end of the year ! Here’s the original summary of the overall concept. See comments on the current 6PAC season at Stitchers Guild. This inspiration has been running successfully for several years. Do all those possibilities make you feel overwhelmed and confused ? If so – start with outfits rather than trying to achieve interchangeable items. Perhaps it’s your personal style to wear a few favourite outfits, rather than wanting to look different each day. Here’s an encouraging piece from YouLookFab. And another post from her, on ways of building outfits. Simpler than a Core 4, if you only wear pants never skirts, or the other way round – a Key 3 : layer, top, bottom. 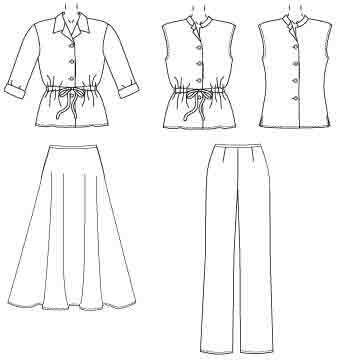 – 3 skirts plus either pants or dress. A coat gives 13 items. She uses 2-3 basic colours plus one item in an accent colour. Four pages of suggestions for colour pairs – not only used as solids but also as mixed weaves or prints. 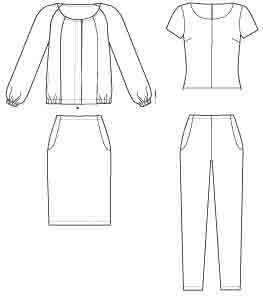 Choose your Tried ‘N True patterns, for top, jacket/ layer, pants/ skirt. Choose 3 fabrics : perhaps dark neutral, light neutral, accent print or solid. Make your 3 patterns in each fabric. Hey presto, 9 basic co-ordinates. . .
Nice and easy – except many of us don’t like to wear the same fabric for both tops and pants ! Perhaps make the 3 in the same colour. I don’t know where this ‘column of colour’ idea started. I heard it first from Nancy Nix-Rice, Lesson 22. Imogen Lamport has several posts with good illustrations – links here. Also she and Jill Chivers have a video on styling up a basic outfit of tee and jeans. Your wardrobe plan could be much simpler : 10 dresses and have done with it 😀 No co-ordination needed ! Though I voice my usual objection to “every woman should have. . .” as I’m a happy zero dresses person. 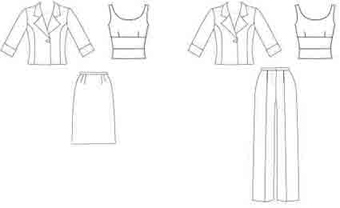 The Vivienne Files has many posts on styling a dress for different looks. They are usually sleeveless sheaths, but you can apply the same ideas to other dress shapes too. If you prefer pants, jumpsuits are a current ‘one-item outfit’ option. Do you feel it would all be too limiting ? Here’s a post from Inside-Out Style on getting variety from a capsule wardrobe. If you decide to make a personal wardrobe plan, rather than ‘winging it’, the process can be daunting. There’s not only the basic group of clothes to pick out, but also your personal style and colours – see my post on so many choices. With all these individual variations, probably few people follow any of these schemes exactly. They can be a good guide for first thoughts. But getting flattering enjoyable outfits is the key goal. Don’t try to do everything at once. Every little step can help. I learned a lot about what’s best for me by trying to fit myself to other people’s plans.